More than 65 years after the end of the Second World War it is easy to assume that there's nothing fundamentally new to be unearthed about the conflict that shaped the second half of the last century and the world we live in today. 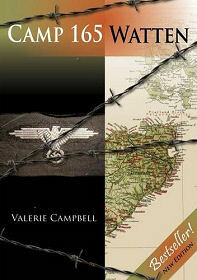 If ever you were tempted to fall into that assumption, then "Camp 165 Watten" by Valerie Campbell will put you right. The subtitle of the book, "Scotland's Most Secretive Prisoner of War Camp" goes a long way to explaining why almost nobody who was not directly involved had ever heard of Camp 165 before the publication of Valerie Campbell's book, still less knew anything of the fascinating stories which emerged from its three years of operation. When someone tells a previously unknown story for the first time, the way they approach their subject, the care with which they research it, and the detail with which they tell it all have a profound effect on the particular facet of history addressed: for no-one can ever tell the same story again for the first time. With that in mind, it is a pleasure to be able to report that Valerie Campbell has done full justice to her subject. "Camp 165 Watten" brings to life the events that occurred in this little known area of central Caithness with an approach that combines scholarly attention to the detail and the facts with a deep regard for the many individuals whose lives were in one way or another affected by the establishment of the camp here. At one level the book is the story of a military training camp which began to be converted to house prisoners of war just as World War II came to and end, and continued to do so until early 1948. The changes that took place during that time are detailed, as are the daily lives of the prisoners, their guards, and the wider community. But the book also takes a much wider view. Readers learn a great deal that will be new to most about the systems put in place by the allies for handling the ever increasing numbers of prisoners in their hands at the end of the war, and even more about the individual stories and motivations of some of the real people on both sides of the wire. The result is a thought provoking and highly illuminating book.